Whether in or out of the closet, gays and lesbians played an essential role in shaping studio-era Hollywood. 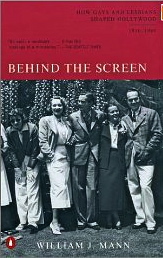 Gay actors (J. Warren Kerrigan, Marlene Dietrich, Rock Hudson), gay directors (George Cukor, James Whale, Dorothy Arzner), and gay set and costume designers (Adrian, Travis Banton, George James Hopkins) have been among the most influential individuals in Hollywood history and literally created the Hollywood mystique. This landmark study-based on seven years of exacting research and including unpublished memoirs, personal correspondence, oral histories, and scrapbooks-explores the experience of Hollywood’s gays in the context of their times. Ranging from Hollywood’s working conditions to the rowdy character of Los Angeles’s gay underground, William J. Mann brings long overdue attention to every aspect of this powerful creative force.